Synopsis: When Colin Leventhal leaned out his bedroom window on the night of May 12th and said goodbye to his girlfriend, he never expected it would be forever. But when Sarah Evans goes missing that night, Colin's world unravels as he is transformed from the boyfriend next door to the main police suspect. Then one year later, at her memorial service, Colin makes a phone call that could change everything. Is it possible that Sarah is still alive? And if so, what is Colin willing to do to bring her back? And as Colin struggles with this possibility, across the street, Sarah’s little sister Claire learns how to navigate the strange new landscape that is life without her sister. Even as her parents fall apart, Claire is determined to keep on going. Even if it kills her. Ally Malinenko is here today sharing the AWESOME cover for her YA novel, This Is Sarah, and giving us a glimpse into her morning. Welcome, Ally! Thanks! So, here's what my mornings look like. The alarm goes off at 5 am. No wait, that’s not right. It’s before 5 am. My husband nudges me and I murmur five more minutes, please, just five more minutes burying my head under the blanket. Then June, the tabby cat, starts crying. And not your usual meows – these are ear splitting, I’m-dying-give-me-food-now-you-puny-humans sort of cries. Really intense End of the World Ragnarok sort of stuff. We stumble up and out of bed. Coffee on. Teapot on. Cat fed. Pee. Computer on. Radio on to classical station. Teapot whistles – oh teapot why must you be so loud! Then I sit in my closet (literally) and write. Sometimes I write poems or stories, provided I managed to think of an idea since yesterday morning. Most times I go back to the current novel. I read through yesterday’s writing. June comes in. She climbs into the empty comic book box on the floor and curls up to sleep. Good. This lasts seventeen seconds. Then she’s trying to climb into my lap. I give in, reading through yesterday’s writing. She stands on my lap and meows at me. I bend my arms around her to rewrite stuff and wonder how one person can switch tenses that quickly. I catch typos. I fix them. I write. I put June down. I think about my main character – how angry he is right now facing this pain alone. I put words in his mouth. I read them out loud. I cringe. I delete them. The cat jumps up on my lap again. I finish my tea and make more. I write some new dialogue. I look at the clock. The morning is going too fast. I have to get ready for work soon. I write some more. I check my email again. I put June down. She cries. I delete three paragraphs of what I just wrote. I yawn. I get more tea. I write. I reread it. I cringe less. I write more. I reread it. I skip ahead and jot down notes for a future scene. June cries and jumps back in my lap. My husband comes by, reminds me of what time it is. I squeeze out another page but don’t have time to reread it. I save my work, shut off the radio and get ready for work. I hope tomorrow morning will be just as good. June meows. She hopes so too. Ally Malinenko is the author of the poetry collection, The Wanting Bone (Six Gallery Press), and the children’s novel Lizzy Speare and the Cursed Tomb (Antenna Books). 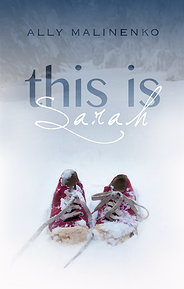 This Is Sarah is her first YA book. Ally lives in Brooklyn with her husband and a very ridiculous tabby cat. She blogs at allymalinenko.com and you can follow her on Twitter at @allymalinenko. Thanks so much for helping to spread the word about Ally and her upcoming release with BookFish Books! Thanks for helping with the cover reveal! Happy to help, and I'm so excited for the book! I know! I think I'll need to keep the Kleenex handy while reading this one! this sounds like such an emotional and heartbreaking read. I am definitely interested! I'm so looking forward to reading this; can't wait for its release!